You’re working on a document and discover that you need to send part of it in an email to a colleague. Rather than manually creating a new email in Outlook before you can paste the text, you can simply paste it while in Outlook. How does Outlook know what type of item to create? Whichever section you’re in (Mail, Calendar, People, Tasks), that’s the type of item Outlook will create using the text you copied. To do this, select content from another document, such as Word or Notepad, and press “Ctrl + C” to copy it. In Outlook, click the section name on the “Navigation Bar” at the bottom of the screen for the type of item you want to create. For our example, we will create a new email, so click “Mail”. NOTE: If you’re using compact navigation on your “Navigation Bar”, click the envelope icon to access the “Mail” section. Press “Ctrl + V”. A new email message is created and your copied text is pasted into the body of the message. Add the recipient(s) and a subject line, and make any necessary additions or changes to the text, and you’re ready to send your email. 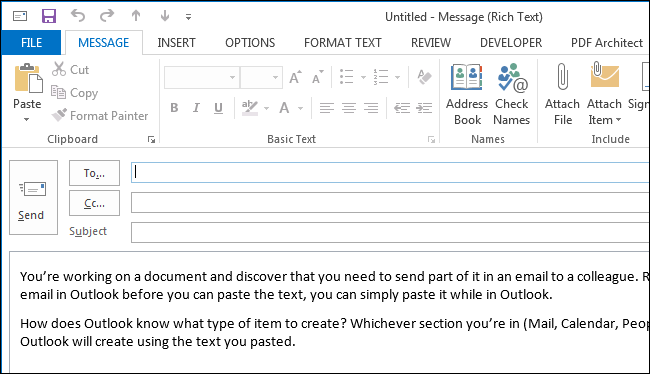 So, instead of first creating a new item in Outlook and then pasting your copied text into that item, you can do both in one step, saving you some time.